The world of sparkling wine is many and varied and although I have largely confined myself to the pleasures of champagne, sometimes you have to get out of your comfort zone. So I was game to visit the cava producer Vilarnau whilst I am spending time here in Barcelona. 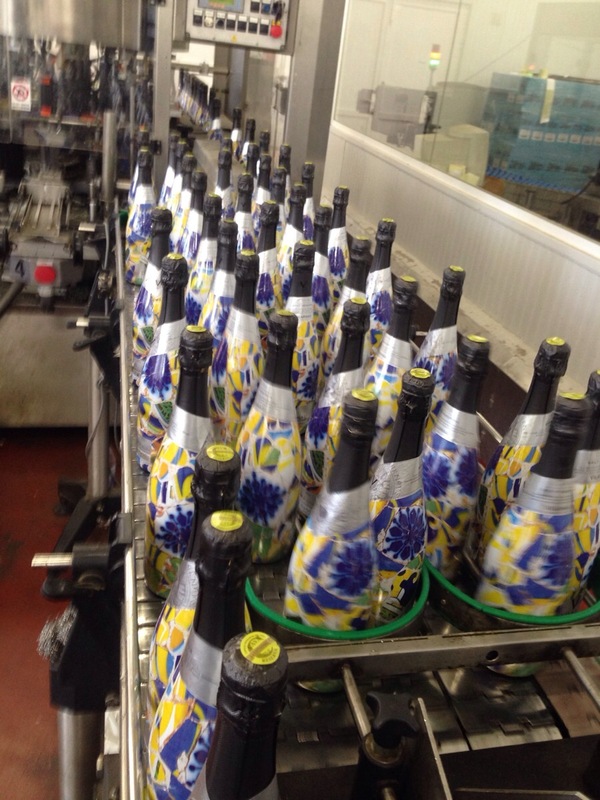 Cava has recently overtaken both champagne and prosecco in the UK marketplace so they must be doing something right. 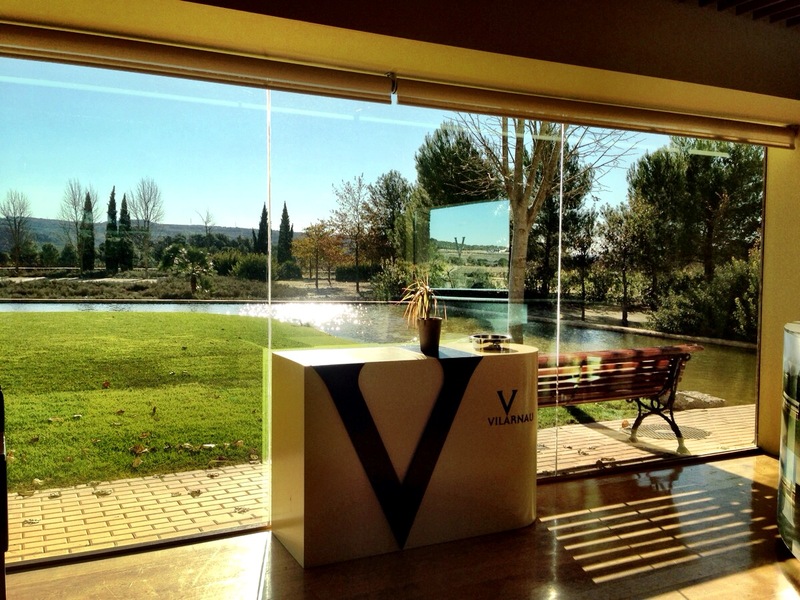 And so, Vilarnau was my first stop in discovering the world of cava. 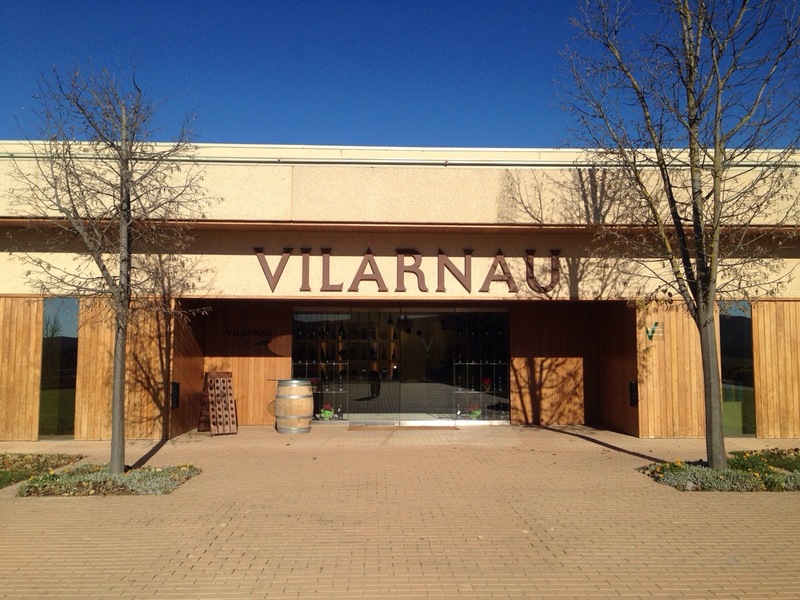 The Vilarnau winery is situated in the heart of Penedes, right outside the town of Sant Sadurni, a short 40 minute train ride from central Barcelona. The winery sits on rolling hills with the mountains of Montserrat as a backdrop to the vines. The day I visited it was a blustery day so we had a clear view of the mountains. Vilarnau was bought by Gonzalez Byass in 1982 and with the considerable resources that GB has, they have completely modernized Vilarnau. The new winery was inaugurated in 2005 and with the help of automation and a robotic ‘helper’ by the name of Manuelito (more on him later) they are able to produce 1.2 million bottles of cava a year with only a staff of 13 and they are considered a medium sized producer. Pretty impressive. 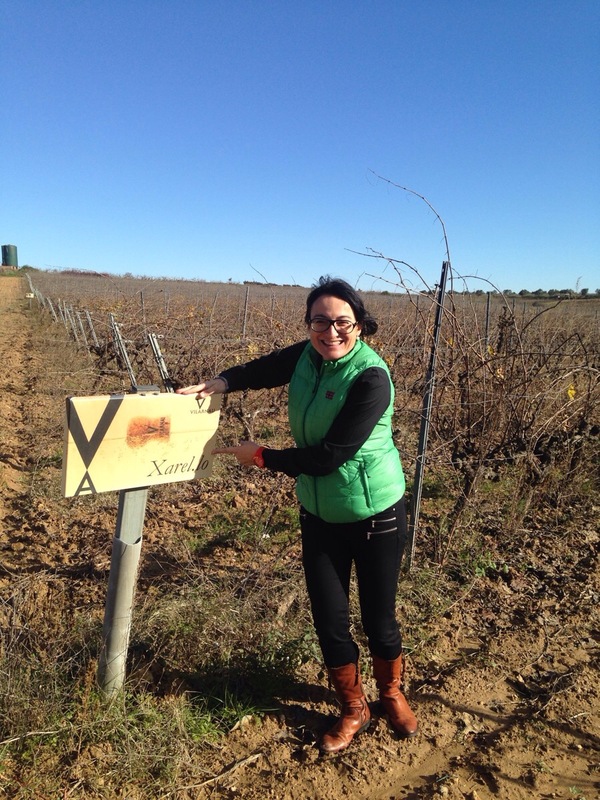 One of the two enologists of the winery, Eva Plazas Torné was my guide for the afternoon. Eva first started by telling me about the differences and similarities between cava and champagen. I was keen to know as cava is made in the traditional methode. Firstly, there are 3 main varieties in cava – xarello, macabeo and parellada. However, they are also allowed to use subirat parent (an old variety that was used in the past and similar to malvasia) chardonnay and pinot noir and for the rosés, they can use indigenous grapes – trapat, monestrell and garnatxa as well as pinot noir. Like champagne,the wine goes through 2 fermentations, the first usually in tank, the second in the bottle and here is a big difference between the champagne and cava making processes – they do not use reserve wines to make cava, all cava is made from one vintage. Eva told me that they have to do this because the varieties they use do not have enough acidity to last for decades as they do in Champagne. They also never put the wines through malolactice fermentation because of the high sugar content and low acidity of the grapes. It’s not uncommon to start harvest in the middle of August (with the chardonnay) and finish in mid October, it’s a long picking season in Penedes. Another point of similarity between cava and champagne, both use the growers system whereby they get the majority of their grapes from independent grape growers. 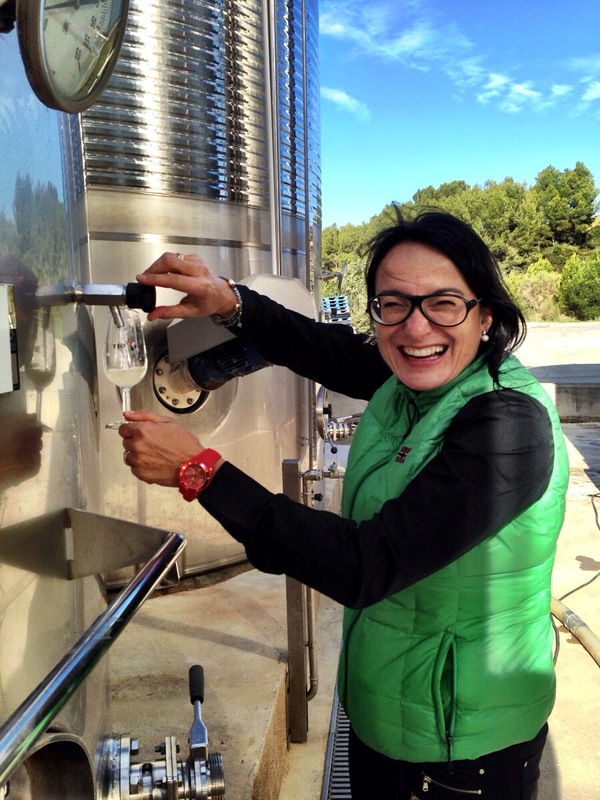 As they don’t use reserve wines in their blending, Eva had just finished working out the blends for this year’s harvest and while I was there they were busy doing the blending in tanks. I got to try xarello and parellada from the tank. It’s always interesting to taste the base wines and I’m getting good enough that I can now actually tell the difference between the varieties – the xarello definitely has structure and acidity compared to the parellada. Another point of difference is that due to the low alcohol levels they always add 24 grams of sugar before the second fermentation. They do this because after the second fermentation, they have an alcohol level of 10% and they know that if they add 24 grams of sugar, they will finish with an alcohol content of 11.5% and an atm of pressure of between 6 and 7. After disgorgement, the atm of pressure is 4.5. After visiting the tanks, we went into the winery to have a look around. 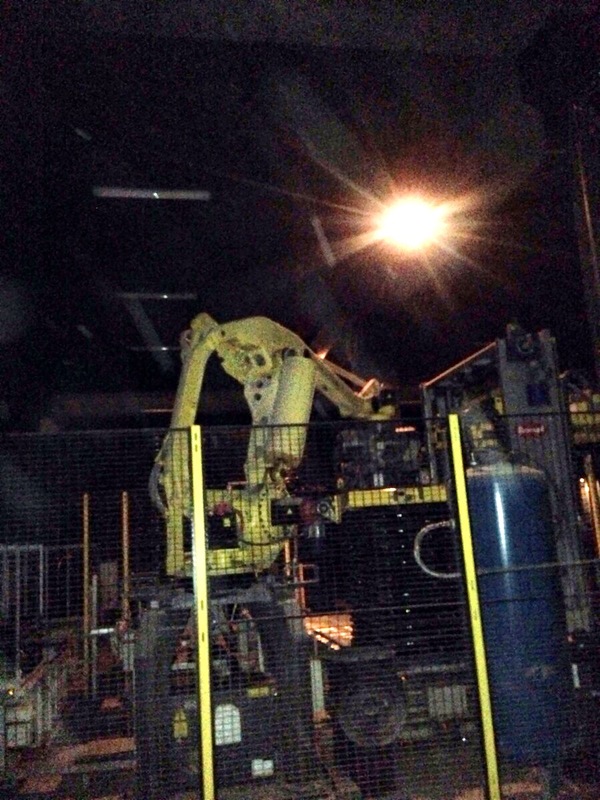 This is where I met Manuelito, the robotic arm that stacks the bottles into the cages to be used in the gyropalette. He’s pretty fast and Eva told me that now they only need one person in the warehouse to oversee Manuelito and put the bottles in gyropalettes. After the tour of the winery it was time to see some of the experiments they are doing at the winery but that will be for tomorrow’s post, so stay tuned….